Here are some of my general thoughts on Kip's cheating at the Boston Marathon. 1) Kip obviously changed outfits during the race. He could have simply shed the jacket and pants, but the hat change suggests that he had a clothes stashed somewhere along the course. 2)Don't think he could have biked or driven the course. It would be impossible to jump in at every 5k mat, Jump out, circle back to bike or car and get to the next point in time unless he biked the entire course. And we see from some of the photos that he is obviously not on a bike during the early stages. 3)So if the first two points are true, he would have to have someone helping him. We already know or at least suspect that his buddy Ben is in on this ruse. So it may be him or there may be others. 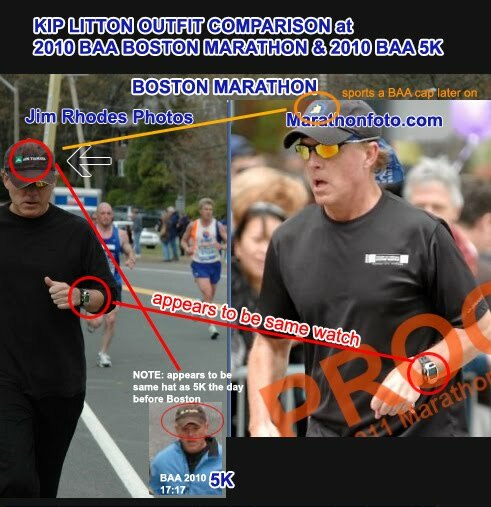 4)We clearly see photos of Kip at the 15k, 20k, and half and late stages of the race. This probably rules out 2 runners each doing a part of the course. Otherwise you wouldn't expect to see photos of Kip so early in the race. Plus the unusual splits make it unlikely that someone was really running the course. ...The only questions that this theory still leaves unanswered is why Kip appears to be going so slow in the 20k photo. first, your point #2. Just because he didn't use a bike/car at every 5k/early in the race, doesn't mean that he didn't strategically use something like that at some point later on. For example, run the first 20k/half... take a single bike/car stashed just after the 20k or the half. Then drive/ride at least the next 5k, or if you need more of a breather, park it/get off to trigger the 25k split and drive/ride to the 30k'ish point. Then back to running. That would basically require running a half marathon in 1:25:30 (with a fade at the end), and last 7-10 miles or so. A nice breather in between. Seems logistically easier to manage. No accomplice to gum up the works. We know he had some kind of uniform change. That 20-25k split keeps jumping out at me. His consistent 6:20-6:33 pace dropped off a cliff between the 20-25k points. Especially bad was between 20k and Half (8:34 pace). Maybe he was going slow in the Jim Rhodes picture because he was starting to struggle before taking his "break". IMHO, it would be really helpful to determine for sure which (if any) pictures were taken between the 20k&25k points. In my opinion, wherever the big gap is between pictures is a good place to dig. where along the course was Jim RHodes photo taken? I'm not going to be as helpful with this picture. Given the rural feel of the setting, certainly it's before the turn onto Commonwealth Ave and even before crossing over Rt 128, which I believe is around the 16 mile mark. This picture appears to me to be consistent with the 30K point. It's a slightly uphill section, and the runners are spread out more thinly than they would be before Rt. 128. The crowd is fairly sparse, too, and there's no sidewalk. Then there's a frontage road behind the spectators. This is how Commonwealth Ave. is configured - it's one major road and a parallel road to the north. Then note the street coming in on the right which doesn't intersect with the main road. Only road in that area which matches is Risley Rd., which I believe is about 200 yards before the 30K point. Not saying it happened but I think it's possible. Spectators are watching the runners. Runners are not watching the spectators. You can walk up to a point on the course, stretch or do whatever you need to look normal, and start jogging. Getting off and blending in is even easier. And if you are only running the mats +/- 2 blocks, the circle back to get the bike is no big deal. Jog 8 blocks, bike 5k, rinse, repeat. Wouldn't be very fun though. btw to pull this off you wouldn't be biking ON the course. You'd bike back streets, and lock your bike well off the course. Guys, a possible breakthrough for the P.f. Chang Rock n Roll Arizona Marathon 2010 where Kip supposedly ran 2:51:21. 30K! Right in the file name. His brother is married isn't he? 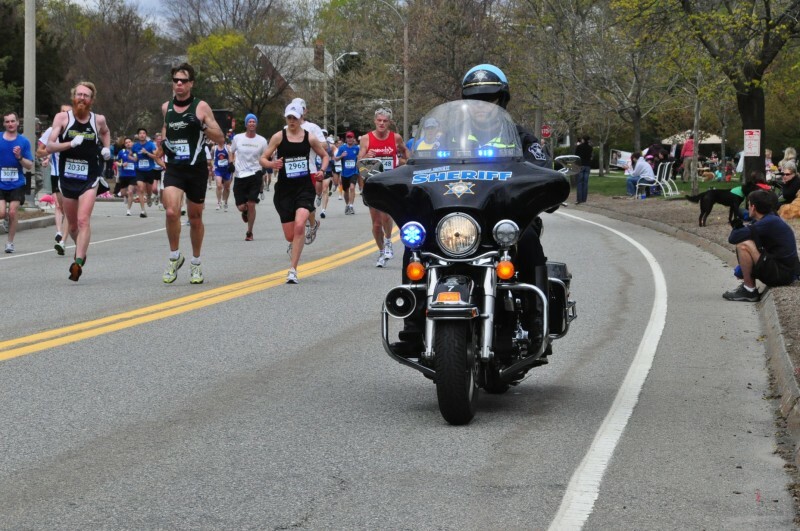 There's a photo of his brother Kurt at the 2007 Crim just before the finish line. You can clearly see his ring finger in the photo - but no ring on it. Bib 8073. Interestingly, Kurt finished side by side with a 39 y.o. female with the same last name but there's no picture of her. Even more interestingly, the brother and his female companion crossed the start line about 6 mins after the gun went off...neither has a split time at the halfway mat...and the brother looks very fresh at the finish in his golf shirt - like he didn't run or even walk 10mi. Granted, it took them well over 2hrs to finish. FWIW, I noted in my log book that it was hot & humid that morning. 2008 No pics of Kip.....I didn't run, but I looked up a couple guys randomly who finished right near him - plenty of pics for both. 2009 Pics of Kip at the finish line only (he DOES look like he's in great shape).....lots for me all over the course (2 mile mark, just before halfway, 9 mile mark, finish straight, finish chute, etc.). Not sure any of this means anything, but I'm getting intrigued about his brother possibly being involved. They do bear a pretty close resemblance. Especially when hats, long pants, sunglasses, and jackets are involved. outfit comparison (watch) ties Litton at both points? Looks like a match on the watch. The black tee shirt is a 2008 Bayshore race shirt for reference. 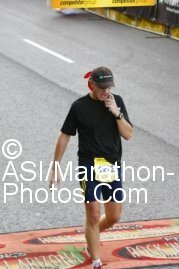 well Kip does wear the same design of hat at 2:51 PF Chang Arizona as he sported at 17:17 BAA 5K & Boston Marathon @ 15K & 30K. Whoever said he was fat needs new glasses- this idiot is ripped. is he on the motorcycle? On second thought, that's probably exactly how long it should have taken them to get to the start mat assuming they started at the back of the pack. Never mind that part. He could be using a motorcycle -that would be bold, but the more outlandish the better it seems for this guy- but I don't think that's him in the picture. Anyone know if he sticks around after any of his races for the awards ceremony to collect prize money, medals, plaques, etc? I know he probably did at WWM, Pine Hills 5k, and Sandy Springs half marathon but how about any races that had 50+ people? This isn't at the start - the race starts in downtown Phoenix, the background is somewhere out on the course. Those races only exist in Kip's mind. I know and that is why I picked those three races. Sorry, I find it hard to get sarcasm across in a thread. But my question still stands: does anyone know if he ever sticks around for the awards ceremony?? Not Kip, but the udder guy you guys have been looking at.